Since I have a 22/45™ in my collection, and I make my own 1911 grips out of Brazilian blood wood, I decided to make this modification. The red grips would be a great contrast against the black frame. File/sand/mill the palm swells so the sides of the frame are perfectly flat. Install 1911 grip bushings. Since the frame is plastic these may have to be epoxied in place for extra strength. 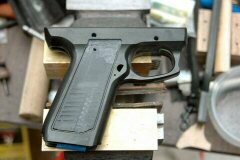 First I completely disassembled the grip frame following the instructions on the Guntalk-Online web site. This is literally a matter of pushing out pins and having parts fall out. I was careful not to lose any! This was also a great time to clean all the nooks and crannies that I couldn’t reach during normal cleaning. Many of the pivot pins are held in place by a spring that sits in a groove; thereby allowing the spring to perform double duty. The instructions on the Internet say to use a high speed rotary tool with a sanding drum, small grinding wheels, and files to make the palm swells flat. Since I have a milling machine at home I decided to mill the palm swells. I couldn’t securely chuck the frame horizontally because of the taper in the grip frame, so I chucked it vertically in the machinist’s vise on my mill. I used a four-inch long 1/4” square end bit at 700 RPM to “shave” off the palm swells. This left a one-inch ridge at the top of the grip frame. I used a high-speed rotary tool with a coarse sanding disk to sand down the one-inch ridge. I then used the tip of a cone grinding stone to finish sanding down the ridge in the corners where it was recessed in the frame. I modified an old 1911 grip I had so it would fit onto the frame on the appropriate side. I marked the location of the grip bushing holes, then drilled using a #3 drill bit. 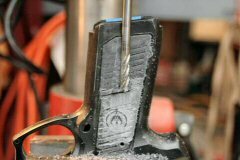 I then tapped the holes using a 1911 bushing tap I purchased from Brownells #080-598-236. Long ago I purchased a 1911 Auto Bushing Driver bit from Brownells #080-434-045. This is the right tool for installing and removing 1911 grip bushings. Although I was able to get the bushings snug onto the frame, I still epoxied them in place so they would not come loose. After I reassembled the gun I noticed that the sear pivot pin protruded about 1/16” from each side of the frame. I took a round-end rasp and my high-speed rotary tool and cut an indentation in the grip to accommodate the pin. Since the grips were already fitted to the frame prior to installing the grip bushings, the grips fit perfectly. I had to file a small cutout in the top left corner of the left grip to accommodate the bolt lock lever. Because the grip frame of the 22/45™ is wider than a 1911 grip frame, once the 1911 grips were installed, the grip felt much beefier. The gun itself also felt heavier, which should help with accuracy. Even though I used a mill to remove the palm swells, the instructions on the Internet showed how to make this modification using a rotary tool and files. 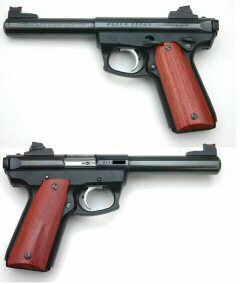 Now, with a few modifications, I can use 1911 grips on my Ruger® 22/45™.